The US government shutdown is the longest in US history. Here's how it compares to the 1995-96 shutdown, widely considered the worst before now. If the government shutdown doesn’t end by Saturday, it will become the longest in US history. Currently, the longest government shutdown in history took place from 1995 to 1996 under former President Bill Clinton. That shutdown came less than a month after another shutdown in November 1995, and was the result of the same set of budgetary issues. The record ’95-96 shutdown only resulted in 284,000 employees having to miss work, which is less than half of the estimated 800,000 furloughs for the 2018-19 shutdown. Though the two parties were disagreeing about different issues, the 1995-96 shutdown was similar to the 2018-19 impasse in several key ways. The government shutdown that started at midnight on December 22, 2018, is now en route to becoming the longest in US history if Congress doesn’t pass funding bills on Friday. It is unclear when this shutdown will end. President Donald Trump said he won’t budge until the Democrats approve $US5.7 billion for the wall he wants along the US-Mexico border. On Wednesday, Trump vowed to continue the partial government shutdown after a contentious meeting with Democratic leaders Chuck Schumer and Nancy Pelosi about funding for the wall. Currently, the longest shutdown in US history took place under former President Bill Clinton while Republicans controlled both houses of Congress. It lasted over three weeks, from December 15, 1995 to January 6, 1996. 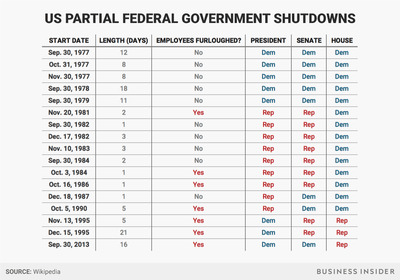 Here’s how it compares to the 2018-2019 shutdown, which on Saturday is likely to become the longest in US history. 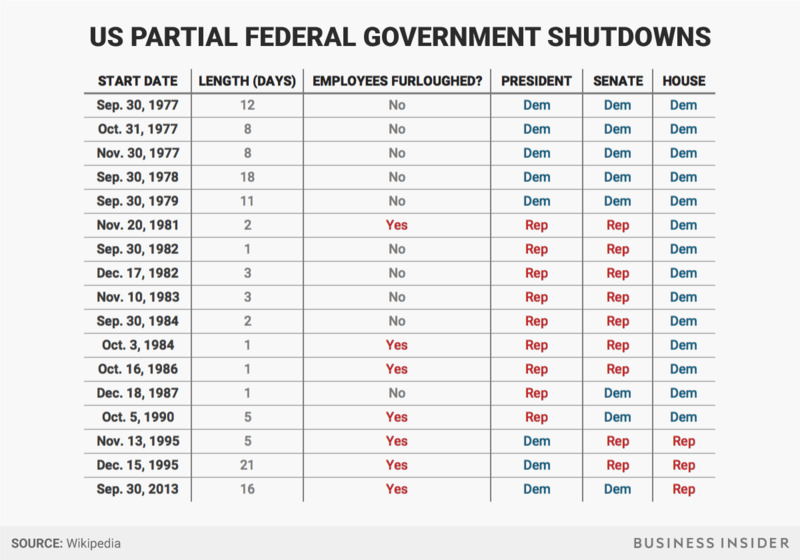 Andy Kiersz/Business InsiderAll of the government shutdowns since the budget rules changed in the 1970s. Before that, government shutdowns simply didn’t happen. That currently record-holding shutdown took place less than a month after a previous shutdown in November 1995 closed the government for five days due to budget battles between Clinton and Republican Speaker of the House Newt Gingrich. Although temporarily resolved after November, the two side’s disagreements on funding for public initiatives spilled over again into another funding impasse soon afterward, leaving the government paralysed as it rang in the new year. Like nearly all funding gap problems, the 1995-96 government shutdown was about a difference in priorities. While Gingrich was dead set on reducing government spending at the federal level, Clinton wanted to expand spending on Medicare, education, the environment, and public health. 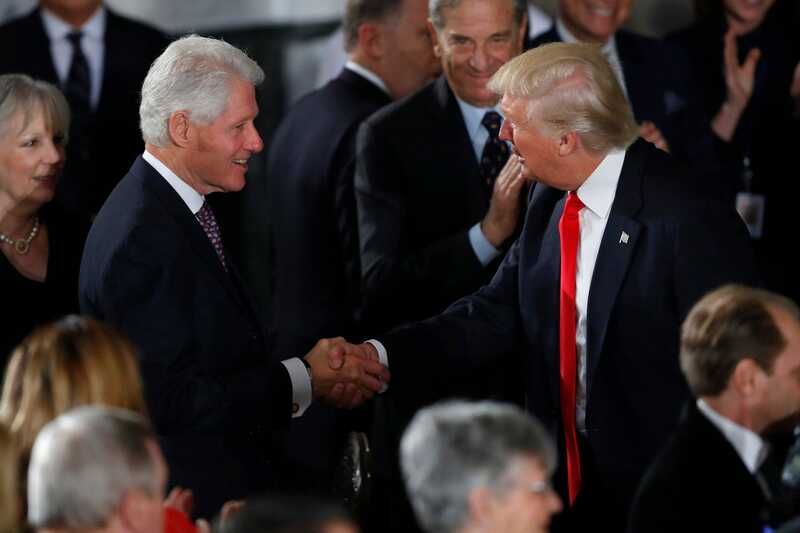 Aaron P. Bernstein/Getty ImagesPresident Donald Trump greets former President Bill Clinton at the US Capitol on January 20, 2017. While federal spending as an idea was not a sticking point in the 2018-2019 shutdown, this stalemate is similar because the two parties have vastly different ideas about how to tackle what is perhaps the most visible issue in the Trump era – immigration. Democrats vehemently refuse to grant Trump $US5.7 billion in border wall money. Though Trump previously said he would be “proud” to take the blame for the shutdown over the wall, Republicans are now pointing the finger at Democrats. Though the House – which switched hands during the shutdown and is now under Democratic control – voted to re-open the government, McConnell has said the Senate won’t pass any funding bills that do not get the president’s approval. The delayed effect of the impasse on work in Washington is similar to what happened during the Clinton-Gingrich shutdown. Because government funding officially ran out at the end of Friday, December 15, 1995, the full effects of the shutdown were not felt until thousands of government employees were furloughed starting Monday, December 18. While the 1995-96 shutdown has been the longest in history so far, only about 284,000 employees were forced to stay home during the three-week period, compared to the 800,000 who were furloughed during the five-day shutdown in November 1995. As if to add insult to injury, just as Clinton and the Republicans were reaching a deal on Saturday, January 6, a massive blizzard dumped two feet of snow on Washington, DC, forcing government workers to stay out of the office for yet another five days. Today, 800,000 federal workers won’t receive their first 2019 paycheck if the government doesn’t reopen. Could this shutdown shatter records? Though Pelosi tried to re-open the government with a House-approved spending plan, Trump and McConnell continue to refuse to pass anything through the Senate or the White House. On Tuesday, Trump delivered his first Oval Office address, during which he parroted talking points about the need for border security. On Thursday, he said he “maybe definitely” might declare a national emergency on what he has referred to as a “crisis” at the border – a claim Democrats have criticised, and experts say isn’t accurate.